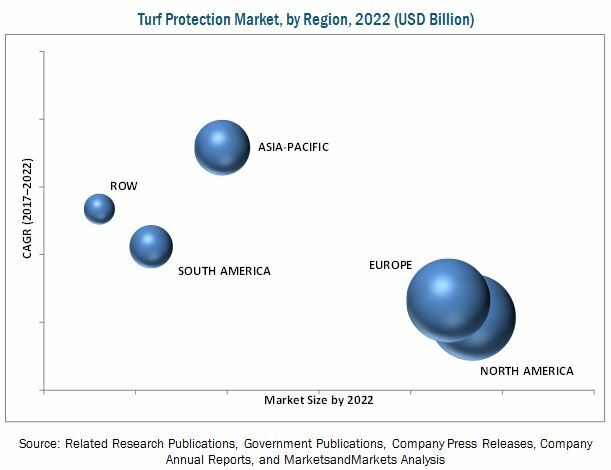 [134 Pages Report] The turf protection market is estimated at USD 5.15 Billion in 2017, and is projected to reach USD 6.41 Billion by 2022, during the forecast period. The objectives of the report are to define, segment, and estimate the global turf protection market size, in both quantitative and qualitative terms. The market is segmented by solution, product, mode of application, and region. It aims to provide detailed information about the crucial factors influencing the growth of the market, strategical analysis of micromarkets, opportunities for stakeholders, details of the competitive landscape, and profiles of the key players with respect to their market share & competencies. The top-down and bottom-up approaches were used to arrive at the market size and obtain the market forecast. Data triangulation methods were used to perform market estimation and market forecasting for the entire segmentation listed in this report. 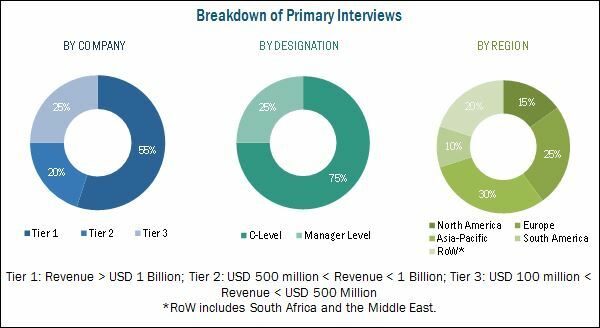 Extensive secondary research was conducted through databases such as FAOSTAT and World Bank data to understand the market insights and trends, which was further validated through primary interviews. The report provides both qualitative and quantitative analysis of the turf protection market, the competitive landscape, and the preferred development strategies of key players. The key manufacturers in the value chain include Dow AgroSciences LLC (U.S.), Syngenta AG (Switzerland), The Andersons Inc. (U.S.), FMC Corporation (U.S.), Idemitsu Kosan Co. Ltd. (Japan), Epicore BioNetworks Inc. (U.S.), Eco Sustainable Solutions Ltd. (U.K.), Pure AG (U.S.), CJB Industries, Inc. (U.S.), Martenson Turf Products, Inc. (U.S.), Sharda USA LLC, Vriesland Growers Cooperative, Inc. (U.S.), Evans Turf Supplies Ltd. (New Zealand), Soil Technologies Corporation (U.S.), Nuturf Pty. Ltd. (Australia), Lallemand Inc. (Canada), CoreBiologic, LLC (U.S.), AMVAC Chemical Corporation (U.S.), Growth Products Ltd. (U.S.), Oasis Turf & Tree (U.S.), Backyard Organics, LLC (U.S.), TeraGanix, Inc. (U.S.), Howard Fertilizer & Chemical (U.S.), and Lucerne Biotech UK Ltd. (U.K.). This research report categorizes the turf protection market based on solution, product, mode of application, and region. The turf protection market is estimated at USD 5.15 Billion in 2017, and is projected to reach USD 6.41 Billion by 2022. The factors influencing the turf protection market growth are the rising demand from residential & commercial properties (including sports fields) and adoption of Integrated Pest Management in the turf industry, which uses a broad and systematic approach to control pests, in turn fueling the demand for turf protection products. The global market is segmented by solution, product, mode of application, and region. On the basis of solution, the chemical segment held the largest share in 2016. Synthetic chemical is still one of the most widely used methods for turf protection; this segment is dynamically growing in terms of product range. Stringent regulations have hampered the market for chemical solutions; however, the usage of synthetic/chemical products is still on the rise due to their cost-effectiveness and extended shelf-life. The turf protection market, by product, is segmented into stress protection, pest protection, and scarification. The pest protection segment held the largest share in 2016. This is due to the usage of chemical treatment which involves the usage of pesticides and insecticides having a high level of selectivity, which helps in controlling pests present in grasses on turf. The global market, on the basis of mode of application, is segmented into seed, foliar, and soil. The seed segment held the largest share in 2016. This is due to its wider application over turf grasses. More than that, seed coating or seed treatment method is also a cost-effective method which makes it favorable to turf managers. The North American region held the largest market share followed by the European region in 2016. This is due to a rise in the number of sports fields and the adoption of Integrated Pest Management, which requires an organized method of pest protection for turfs. The major restraining factors affecting the turf protection market are stringent & inconsistent regulations for synthetic chemicals and the rising R&D costs associated with formulating newer active ingredients. The companies profiled in this report include Dow AgroSciences LLC (U.S.), Syngenta AG (Switzerland), The Andersons Inc. (U.S.), FMC Corporation (U.S.), Idemitsu Kosan Co. Ltd. (Japan), Epicore BioNetworks Inc. (U.S.), Eco Sustainable Solutions Ltd. (U.K.), Pure AG (U.S.), Lallemand Inc. (Canada), CoreBiologic, LLC (U.S.), Lucerne Biotech UK Ltd. (U.K.)., Soil Technologies Corporation (U.S.), Nuturf Pty. Ltd. (Australia), Backyard Organics, LLC (U.S.), TeraGanix, Inc. (U.S.), and Evans Turf Supplies Ltd. (New Zealand). 11.2 Idemitsu Kosan Co. Ltd.
11.8 ECO Sustainable Solutions Ltd.
11.9 Lucerne Biotech U.K. Ltd.
11.15 Evans Turf Supplies Ltd.
*Details on Business Overview, Company Scorecard, Products Offered, Recent Developments might not be captured in case of unlisted companies.